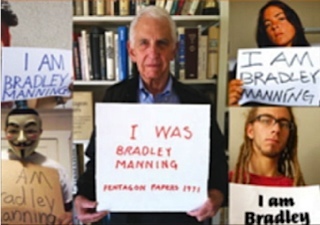 It's unfortunate and disturbing that Bradley Manning's attorneys have chosen to consistently base his legal defense upon the premise that personal problems and shortcomings are what motivated the young man to turn over hundreds of thousands of classified government files to Wikileaks. According to a Feb. 3 article by the Associated Press, "Defense lawyers say Manning was clearly a troubled young soldier whom the Army should never have deployed to Iraq or given access to classified material while he was stationed there ... They say he was in emotional turmoil, partly because he was a gay soldier at a time when homosexuals were barred from serving openly in the U.S. armed forces." His lawyers should not be presenting him that way any more than Bradley should be tried as a criminal or traitor. He should be hailed as a national hero. Yes, even when the lawyers are talking to the military mind. May as well try to penetrate that mind and find the freest and best person living there. Bradley also wears a military uniform. Here are Manning's own words from an online chat: "If you had free reign over classified networks " and you saw incredible things, awful things ... things that belonged in the public domain, and not on some server stored in a dark room in Washington DC ... what would you do? ... God knows what happens now. Hopefully worldwide discussion, debates, and reforms. ... I want people to see the truth ... because without information, you cannot make informed decisions as a public." Is the world to believe that these are the words of a disturbed and irrational person? Do not the Nuremberg Tribunal and the Geneva Conventions speak of a higher duty than blind loyalty to one's government, a duty to report the war crimes of that government? Below is a listing of some of the things revealed in the State Department cables and Defense Department files and videos. For exposing such embarrassing and less-than-honorable behavior, Bradley Manning of the United States Army and Julian Assange of Wikileaks may spend most of their remaining days in a modern dungeon, much of it while undergoing that particular form of torture known as "solitary confinement." Dozens of members of the American media and public officials have called for Julian Assange's execution or assassination. Under the new National Defense Authorization Act, Assange could well be kidnapped or assassinated. What century are we living in? What world? It was after seeing American war crimes such as those depicted in the video "Collateral Murder" and documented in the "Iraq War Logs," made public by Manning and Wikileaks, that the Iraqis refused to exempt U.S. forces from prosecution for future crimes. The video depicts an American helicopter indiscriminately murdering several non-combatants in addition to two Reuters journalists, and the wounding of two little children, while the helicopter pilots cheer the attacks in a Baghdad suburb like it was the Army-Navy game in Philadelphia. The insistence of the Iraqi government on legal jurisdiction over American soldiers for violations of Iraqi law -- something the United States rarely, if ever, accepts in any of the many countries where its military is stationed -- forced the Obama administration to pull the remaining American troops from the country. When people in Tunisia read or heard of U.S. Embassy cables revealing the extensive corruption and decadence of the extended ruling family there -- one long and detailed cable being titled: "CORRUPTION IN TUNISIA: WHAT'S YOURS IS MINE" -- how Washington's support of Tunisian President Ben Ali was not really strong, and that the U.S. would not support the regime in the event of a popular uprising, they took to the streets. "The Russians are coming -- again -- and they're still 10 feet tall!"